Gets the Customer Service Award! When I think of customer service, I like to think of people going all out for the customer, asking the questions the customer doesn’t know to ask, and providing exemplary service. I try to live up to that standard myself, and feel comfortable in expecting it from the people who I pay for service. After all, wouldn’t they want MY level of customer service if they came to me with a problem? Regrettably, that customer service is often unworthy of mention, or, like Sears Customer Service with my dishwasher story, abysmal and profoundly disappointing. Yet, there are examples of great customer service, and I was grateful to be the recipient of that service late last week. This past week was a bit tough as I tried to shake off what felt like the flu. As I sat at my computer, staring at the long list of emails in my inbox, I heard a steady dripping sound. At first, the sound didn’t penetrate my consciousness, and after a few minutes of verifying the kids hadn’t left the faucet on, I realized with dread that the sound came from my air conditioner closet. Like anyone else who’s owned a home, when you hear the subtle drip-drop of water in your A/C closet, you know you’ve got problems. Two years ago, though, when our air conditioner died, I’d reached out to Jon Wayne and they’d come through. Today would be no different, although it would take a day’s worth of work. When the two gentleman from Jon Wayne arrived, they promptly set about addressing the dripping water concern (no big deal, condensation). All of us figured their job would be over quickly. But then Richard A.–who I applaud for excellent customer service–started double-checking coolant pressure and encountered a 50% leak. He made the decision to replace the entire coil–the equivalent it seemed to me of pulling the intestines out of the air conditioner unit–and then proceeded to do so. He encountered problems with a special valve, replacing it 3 times before it finally was fixed. He continually double-checked his work, his clean cut appearance beginning to show wear and tear in the face hours of hard, hot work. Finally, at almost 6:00 PM in the afternoon–he’d started at 10:30 AM–the job was complete and the air conditioner was working great. The cost? Nothing. The whole job was covered under warranty and service plan. 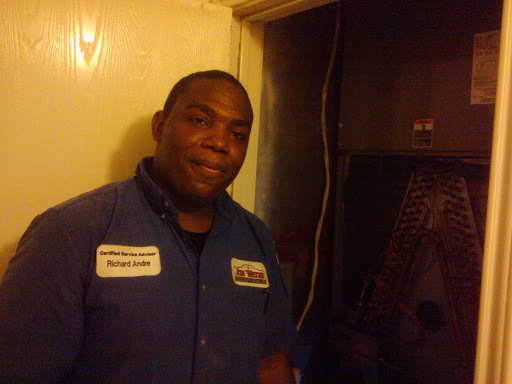 I’d like to applaud Richard and the Jon Wayne Air Conditioning team for a great job, attention to detail and phenomenal attitude!